Freedman Racing :: Gina's Hope Charges! There is a certain amount of added pressure when a horse is a short priced favourite but Mitch Freedman and Jarrod Fry being the laid back combination they are were more confident than nervous when Gina's Hope made her way to Kyneton on Friday. Whilst caller Adam Crettendon admitted to giving the four-year-old little chance of finding the line as she was buried amongst traffic heading to the turn, both Mitch and Jarrod were sure she would be able to let loose once into the clear. And that she did - getting out very wide straightening and then charging, quickly gathering in her rivals and racing away to a soft and impressive two length victory. "If you've got a blood pressure reader, apply it to Mitch's arm," Adam Crettendon joked but Mitch was more satisfied than over the top excited! "She is a mare who has had a lot of issues," he explained, "she takes a lot of maintenance and our staff have done a really good job with her." "It has been a long drawn out process getting her to the track," he said, looking back at when Gina's Hope ran through several fences at two. "But she has a fair amount of ability and she can measure up in a better race." "She was awkwardly placed in the run," he said, "but I know that she is got a good turn of foot and I knew she was going to get into the right part of the track." Jarrod Fry agreed - "it was just a matter of getting her to the outside and when she did it was just a matter of three or four strides during which time she was able to put them away." "Drawing inside there was not much I could to about where she was, I just had to be patient... but I was confident in her ability to get to the line like she did." Fry is looking forward to Gina's Hope being tried over more ground - "she will probably get out a bit further, she switched off beautifully in the run and really travelled well." A home-bred for Michael Hirst, Gina's Hope is the second foal and first winner for the two times Tasmanian winning El Moxie mare Elle Of A Westerley who was also bred and raced by Michael Hirst. Not having much luck in recent times, Elle Of A Westerley does however have a yet to be named two-year-old full sister to Gina's Hope whose sire Written Tycoon is one of the hottest stallions in the land. 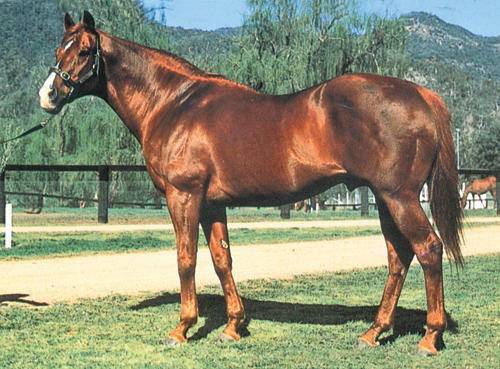 Bred on a 5 X 6 cross of Vain (pictured), Gina's Hope hails from the same family as that legendary sprinter, one that has also produced the stakes winners Justify That, Saleous and Passmore.